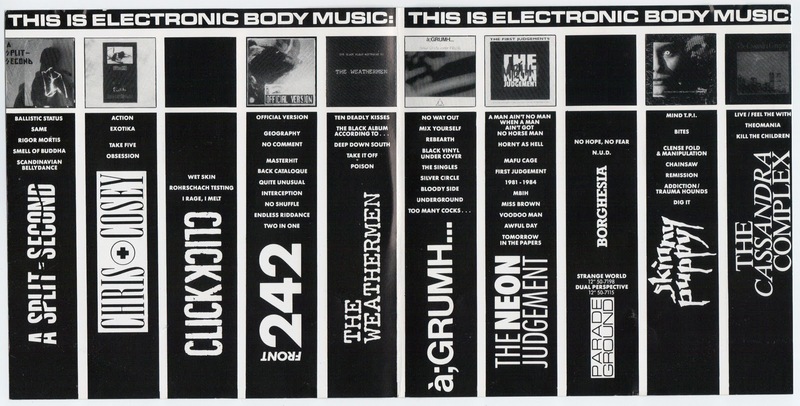 Fell down an EBM (Electronic Body Music) YouTube hole this afternoon and thought I would share. This abrasive prototype industrial/electronic music evolved out of the various strains of post-punk and was pioneered and developed by people like Throbbing Gristle, Cabaret Voltaire and Front 242 into a unique sub genre that contributed directly to both techno and industrial before being slavishly ripped off by people like James Murphy at the turn of the new millennium. The guitar in this is surprisingly reminiscent of Adrian Belew’s work on Talking Heads ‘Remain in Light’. Atmospheric slow burn of a tune. Love the synth pads like they use at the 1:00 mark. Very evocative. Seminal tune that has been sampled and re-worked innumerable times. Always my favourite Cabs track. Great clipped kicks and phat synth bass. Yes, this does sound incredibly reminiscent of the Human League, but somehow grew on me with more listens. Love this one. Hard driving, futuristic punk.